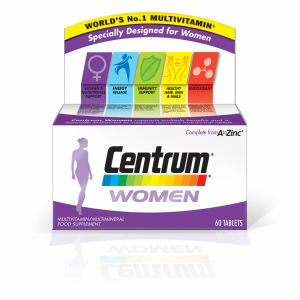 Centrum Performance Multivitamin Tablets have been specifically developed for those with active and sporty lifestyles, delivering essential vitamins and minerals to supplement your nutritional needs and give extra support for energy release. The world’s number one multivitamin is established through 30 years of scientific research and nutritional expertise, combining 23 key nutrients to support physical endurance and energy release. B Vitamins help to unlock energy reserves taken from food for an additional boost, while Iron, Ginkgo Biloba and Pantothenic Acid work in tandem to maintain a healthy and active mind for enhanced stamina and performance. Vitamin B1 supports the normal heart function, plus Vitamin C boosts antioxidant levels and contributes to support of the immune system. Ideal for those who regularly exercise and play sports, the daily supplement ensures you feel ready and at your best.